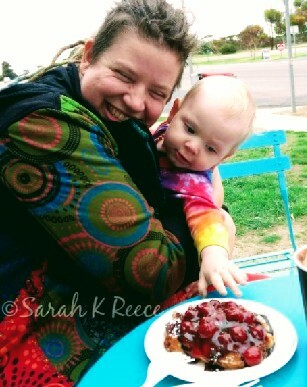 Here we are sharing a chocolate cherry waffle on the way! We are hitching a lift with friends and going to spend the long weekend in Melbourne. Rose kindly set up the trip to give me a proper rest. Mammoth work projects and end of financial year business admin has been taking a toll. Even more pertinent, Van Gogh is being exhibited at the NGV and it’s not often in your lifetime you get a chance like this! So we’re all packed and off on an adventure. I’m nervous and excited and don’t quite know what to expect traveling together. Rose has held my hand through all the jitters and worry about traveling and how much still needs to be done at home. Now I’m feeling free and light and hopeful. Getting back onto this blog has been wonderful, even though there’s so much pressing work. I love to feel connected to my online world, and to reflect on what has been and what’s yet to come. It calms me and give me focus, helps me find my connection to myself again. I feel alive again. I get lost and find my way home, over and over. Right now I feel alive and bubbling over with joy. wish I was there – so much to talk about… will have to keep 🙂 – as for the pic – you sharing the waffle? looks more like Poppy wants to claim it, pits and all? 😀 have fun and enjoy a break!